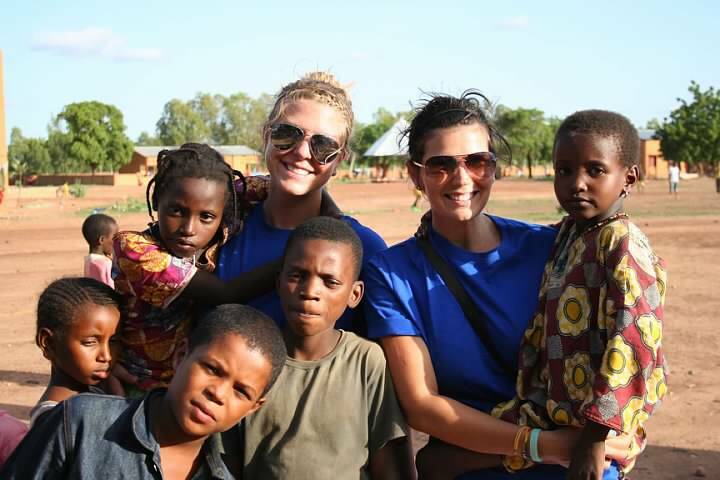 I was so blessed to be able to go on a trip during summer 2012 to Burkina Faso, Africa with Real Impact Missions. It’s an amazing short-term missions organization, and it was a beautiful trip. Part of what made it so fabulous was that it was a great team. 10 of us, from all over the US (literally from Washington to New York and places in between). Our team dynamic was awesome; they were such a willing crew. They rolled with the punches, stayed flexible, and laughed in the hard times. That alone makes for a great 2 weeks, no matter what part of the world you are in! I’ve mulled over what parts of the trip to share about… But I think I’ll stick with a snapshot of what will remain in my memory for years. To tell this story, I have to give a bit of background. Back in 1997, as a student at ORU, I regularly participated in the Praying Through the 10/40 Window effort every fall. This particular year, I was praying through the prayer calendar, lifting up the people groups and areas of the world that were unreached with the Gospel, and I felt the Lord speak a word to my heart. A weird word. I had never heard or read this word before, and didn’t know if it was a place, a language, a people group, etc… I had a feeling it was something to do with world missions, since that was what I had been burdened about in prayer at the time I heard it in my heart. So, since the internet was available at the downstairs computer lab (totally dates me! ), I headed downstairs to search for this word and find out what it meant. I discovered it to be a people group in Northern Africa, largely unreached with the Gospel, with many of its people living in war-torn Sudan. Then began my prayer journey for the Fulani people. Many times over the last 15 years, I have prayed for these people to come to know Christ, for doors to be open for the Gospel to be spread among their people in their language. For missionaries to be sent and equipped to love on them and meet their needs. Every time I heard of news of Sudan especially, my heart would be tugged for these people I had never met. I would often worship in Church and they would come to my mind, so I would sing over them, and pray for the Lord to do a great work among this people. Every few years something would come up where there was a chance to go on a short term trip to North Africa. One of them I considered going on, and pursued it, but the trip itself fell through due to the danger there for missionaries/foreigners. So, fast forward nearly 15 years! Friends of mine have been serving in Burkina Faso doing children’s ministry, and I’m working for a short term missions organization praying through and planning the trips for the summer. God graciously opened the doors for not only the trip to form, but for me to go! I then asked Joel and Heidi (my friends there) if there were any Fulani people there, and they said YES! We did many different types of outreach while we were there, but one of my favorites was working with Kate at Kids of Hope. Probably my favorite because these were Fulani kids! Kate runs a ministry to boys who have been put on the street to beg. They are sent off to beg by a Muslim leader who basically pimps them out (not sexually, as far as I know. Just in the sense that he lords over them and makes them go out to beg every day) and tells them to return with a certain quota of money that they return to him. Kate has been serving these boys for a number of years now, and now has a property in Ouagadougou where they meet and have a safe haven. She feeds them, teaches them about Jesus, and plays games with them. I imagine that a childhood experience was pretty much not available to them if they’ve been sent to the streets to beg, so it was amazing to realize how much ‘play’ is important in her outreach. Let boys be boys as it helps them to be healthy and well adjusted (Don’t I see this in my daily life!). So, for two days of our 2 week trip, we spent time at Kate’s Kids of Hope. We played with them, laughed with them, shared Christ with them through drama and testimonies, gave them toothbrushes and toothpaste, and sat alongside them while they learned the Gospel message and received food and clothing from Kate and her team. During one of our ministry times I was able to share with them how the Lord had spoken to me about their beautiful people and how honored I was that He had brought me there. It was not a ‘big’ moment or a fancy moment, but it was so beautiful to see the fulfillment of something the Lord had spoken 15 years earlier. Even still, the moment was not about me. It was about the Lord revealing how He works in the world. He speaks to our hearts. We allow ourselves to be burdened for what burdens His heart. He keeps stirring our hearts for YEARS, not in preparation for a trip or an experience, but for THEIR hearts and lives to be open to hearing and receiving the Gospel. For these boys to be in the right place at the right time in order for them to be positioned not in the property of a pimp begging on the street, but to be in Kate’s loving outreach, hearing the Gospel message of life and hope. Another aspect of the beauty of this moment was that as I spoke, it was translated into french, then again into Fulfulde… their heart language. A man there from Switzerland had been working with the Fulani for 11 years and he learned to speak their language/dialect… AND he was there in Ouagadougou, visiting from the village where he had been living during this time, and was able to translate our team’s ministry efforts into their heart language! Who knows if the prayers I lifted up 15 years ago also helped strengthen and equip this man to head out to reach the Fulani!? So, friends, this is not so much a post about Burkina Faso, but more about believing and hanging on to the word/words He has spoken to you. (And if you’ve not heard Him speak in this way, just ask! He will!) It’s about His heart for the people around you- or in this case, the people all the way across the world that need His love. What is amazing though is that through our effort to press into the heart of God, we end up changed and blessed. God allowed me to meet these precious boys, to see some of them accept Christ for the first time, to see their hearts ablaze with new hope and faith in the loving Father God. Truly icing on the cake in my walk with Jesus. Click to see the results of a community development project at Kate’s Kids of Hope that RIM completed last year for the Fulani Street Boys! Update: Headed out for Village trip #2! We are doing great! The two-weekers have gone home, and the team of five one-monthers remain. The five of us are enjoying our time together. The lodging situation changed when the 2 week trip left, and now our group of 5 is staying with Joel and Heidi in their guest house. We are loving being here and are learning a lot from them. We started the building project at Kate’s Kids of Hope! 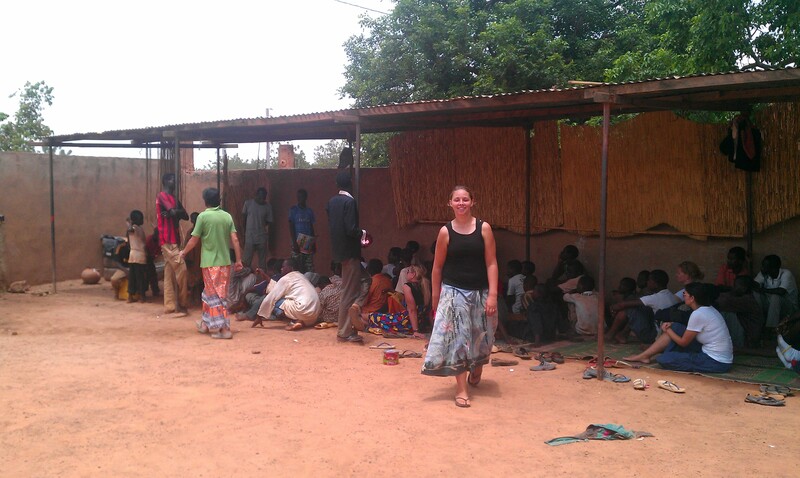 This area in the photo above is of a shelter at this outreach to Fulani street boys that Kate runs. She teaches them about Jesus, feeds them and does her best to help them meet their daily needs for clothing, shoes, etc. The project we are working on is paving the area under the canopy. During the rainy season, the whole property turns into a muddy mess. With concrete under this canopy, it’ll allow for a much more habitable area for the boys to seek shelter from the rain and sun for their lessons, mealtime, etc. We also are working with Josef (Silas’ godfather and one of Joel’s best friends) with a camp. We are each teaching classes: me in English, Lee in guitar, Jessie in piano, Jill in computers, and Lindsay in soccer. There are approx 60 kids and there are gospel and Bible teachings in the mornings and evenings. We are going to do another village trip Friday through Sunday. Then next week we have orphanage time! Want to learn more about the Fulani people and a miraculous answer to prayer? Read Sarah’s story! We just returned from the village trip about an hour ago. It was amazing, eye opening and truly African. We went to a tribe of people called the Nune. It’s a largely unreached people group, with no church or Bible in their native language. The village we visited was called Pobie (pronounced Po-bee-yeh). The village itself had a few hundred people in it, and the surrounding area is full of the rest of the Nune people (I think about 6000 total in the lands surrounding). We arrived late on Sunday night, after dark. After we unloaded our bags, mattresses and mosquito nets into the local school where we would be sleeping, half of us went with our contact here, Pastor Jacques to go and greet the village elders. This was such an interesting experience! We drove about a half a mile from the school, unloaded by flashlight and they laid out some mats outside of their huts where we sat in the near dark, waiting for the elders to come. A family of Nune people looked on and spoke about us in their language while we waited on the mat looking at the stars (which were so bright and visible since we were hours from the city). We were then greeted by the elders, which were family members of Pastor Jacques who spoke Nune, French, Moree, and English. He translated for us. We learned a few traditional Nune greetings from him, and then said goodnight. Over the next two days we did several different types of ministry. We were able to do our drama presentation to the children and other adults, including a puppet show, stories, etc. The people were interested and receptive. Late Monday night we did more drama, shared a testimony, and then the team we are working with presented a movie in their language (on a large sheet out in the village common area, run by a dvd player and projector powered by a generator!). The movie was totally culturally appropriate for the tribe, and totally odd to us! 🙂 So glad that we can minister the gospel in context though, as this people group is so remote that American movies or ministry would be really inappropriate and not relatable. Another of the wonderful things we were able to do was help in distributing the Operation Christmas Child gifts in the village to 100+ children! It was phenomenal and I’ll try to send some photos later if we’re able. This village was full of mud huts, animistic beliefs, no running water, no electricity, and many beautiful and kind Nune people. We’re doing great, only minor stomach aches, and no serious travel bugs so far! We’re looking forward to sleeping in our air conditioned room at our guest houses tonight though! We landed in Ouagadougou, Burkina Faso, Africa around 6:30pm on July 5th. This was no ordinary airport. We actually landed on a runway and were able to walk right off the plane, just like you see in the movies. That was really surreal to me. Then we took a bus to customs and met up with Joel (our missionary friend) who helped us get our luggage and head off to his house. Immediately, as we got on the road, I noticed an extreme difference between Africa and America. The roads were made of red dirt and I don’t know if potholes could even begin to describe the muddled streets. There were masses of motor scooters and bicyclers everywhere. I saw up to four people on one motor bike! Women have their babies strapped to their backs while they’re driving and they don’t seem to worry about the heavy, severe, traffic surrounding them. That made me very nervous to watch due to my love for babies. During the drive to Joel and Heidi’s house I just wanted to take in everything surrounding me, the sounds, the smells, the complete environment. I watched Muslims on the streets turn toward Mecca in unison and pray. I saw children walk from person to person and plead for a sale. I saw women carrying all sorts of belongings on their heads. This was all very fascinating to me. With every breath I took–a new memory came with it. My eyes had been opened SO wide already. My favorite memory of the day: The cutest little boy, around 10-11 years old, came up to our window to sell us a phone card and we all just went crazy. Although we didn’t speak the same language he could sense our excitement and he had a smile on his face that was too big to measure! He was just giggling as we carried on about how handsome he was. I just wanted to pinch his little cheeks off and take them home with me. Taylor’s favorite memory of the day: He loved the crazy driving and seeing so many people out and about on the streets. It was full of life and adventure.